Welcome! Have a browse using the top menus above which drop down into collections. We have thousands of miniatures to choose from! We welcome your questions to sales@alternative-armies.com. We also offer codes pro-painted and based produced by hand in Scotland. Email us for details. We have a friendly Facebook Group; HERE. Outside of this Event: We have two Shipping Zones the UK (flat 5GBP per order) and Rest of the World (flat 6GBP per order). If you wish for Tracked Shipping then select this during checkout for a Flat Rate of 10GBP per order. Large orders are sent by courier at no extra cost to you and we will contact you directly if this is the case. BRADLEY MINIATURES. A new 6mm science fiction range from the United States manufactured in Scotland under agreement. Second Wave Released! BEGIN IN FLINTLOQUE. A new page to get you started with 28mm Napoleonique Fantasy tabletop gaming. Follow Andy Jefcoate's adventures with his Flintloque collection in articles on our BLOG. NEW RELEASES. See the latest new codes for 28mm and 15mm which we have online on this page. Start here if you have not been browsing recently. FREE DOWNLOADS. We have over a hundred free files. Start here if you want content for free for your games. EVENTS AND BUNDLES. All of our best deals and seasonal promotions are here. Save from 10% to 50% on all manner of wargaming miniatures. All of the 15mm ranges formally at our 15mmcouk website are now on this website under three drop menu tabs above; Historical, Fantasy and Science Fiction. You can find details and a list of transferred section links on the BLOG. New releases into two different ranges at Alternative Armies this time. From Grinning Skull Miniatures four new miniatures adding to the weirdness of killer plants and oddness of strange creatures. A two header Sprouter, a Klorzid Sapling, a Nightmare Spider and Worm Pile. These follow up on the new Zargalian codes. In the SHM (Self Help Miniatures) a new 15mm Penguin Commissar (yes really!) the first sculpt by Brendan Sterma. Have a look and also on our BLOG. A new pack of 28mm scale Armoured Goblins adding to the wide choice we already have (including Dodo Riders). These ones are open handed and come with a set of six different weapons meaning a lot of choice plus bits box additions for you. Zach Martin follows on from 2018 as promised. Sengoku Monster Hunters of the Guild released! Five great 15mm Japanese characters. Also four 15mm scale Japanese Buildings as singles or a saver value set. Added to the biggest Japanese 15mm Fantasy range in the world with one hundred and thirty codes. Check out the article for more pictures and information. Medusa? Temple Guardians? Cursed by evil Magic? It is your choice as Alternative Armies now releases two new packs into the HOT 15mm Fantasy Range. Eight different poses of Naga with Bow or Sword and Shield. Packs or skirmish samplers. Read more HERE. Ohhh..gives me the creeps these are so good. Now released two packs of Arachnids great for any scale from 28mm down to 15mm and 6mm. Giant Spiders and Spider Swarms for your games. Great for High Fantasy and many other settings. You can get packs or singles from packs. Sculpted by Kieran Billings who created the Space Brains and Sandworms among other things. New 28mm Barricades! The Library Barricade shows a sadder use for masses of books, the Apothecary has given up potions and bottles and more, the furniture of a small home is piled in defence and lastly some poor sod was thrown out of his sty for his bad including the mattress to be used as a barricade. The value set has all these plus the Long Table, the Crates and Boxes, the Kegs and Barrels plus the Kitchen barricade with a saving of 10%. Four new 15mm Battlesuits in the HOF Range! Yes, four. The Fire Cat, the Steel Cat, the Grease Cat and the Hades Cat. All variants of the Bear Cat Battlesuit. Go HERE. All from the mind of wargamer Fred Richards in conjunction with Alternative Armies. Check them out with plenty of images on our BLOG; plus each suit is 40mm tall. Doom Squad is here! A new rules set by Steve Danes (author of Furioso and Sengoku Monster Hunter) now in print and on sale at Alternative Armies. Use any miniatures, any scale, in small teams over three hundred years of special forces warfare. Solo play or Co-Op play in missions which are always a surprise and changing. Great fun. We also now release a new 28mm Terrain piece the Discarded Kitchen Barricade great for any horse and musket or fantasy setting. Awesome! A new free article this week! We present a great high fantasy scenario and play sheets for DarkeStorme the Skirmish. Written by Vic Dobson the scenario 'Fog of War' can be played in 28mm or 15mm scales. Click through to learn more on our Blog and to download it. Or download it by clicking HERE. A new Flintloque video from Talking About Games (TAG) channel. This time a play through of the scenario 'What Ales You' which carries on the Escape the Dark Czar arc. Click through to watch the video. Go HERE. Wargaming in the 16th Century? 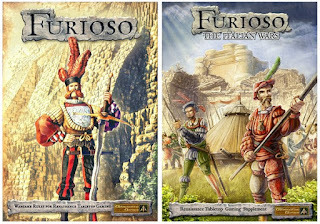 Then Furioso might be the rules system for you especially if you campaign in the fields and city states of Italy. It is our pleasure to present a free QRS download created by player Tony Cane for the game. Now released from Grinning Skull Miniatures and produced by Alternative Armies the Zarglians! Great for any game system and can be used in 28mm and 15mm campaigns if you need strange aliens with ray guns then these are the fellows for you. A total of ten different poses composing two larger leaders, three warriors and five little fighters. Choose from a value pack giving one of each with a big saving or smaller packs and singles. Click through to our BLOG for more pictures and information plus a little tale all about the Zarglians. Our last releases for February 2019. A new pack in the HOF 15mm Science Fiction range for February 2019 and this time it is a Media Team! A male and female reporter plus a camera operator and a camera drone. Great for many settings and for going into conflict zones alongside Security Force Alpha to get the low down on the fighting. Click through HERE to learn more and to see some more pictures on our BLOG. Choose from a pack or single poses. The brand new Bradley 6mm science fiction releases (thirteen new packs). A total of twenty seven different vehicles and infantry to choose from. We are delighted to show off a few of these new codes painted by Alternative Armies studio as well as scale and scenic pictures too. Click through to have a look. Thanks! The 28mm terrain range expands with three new codes at Alternative Armies. Great for use in Flintloque or any Fantasy or Horse and Musket setting our terrain is highly detailed and full of character. Barricades to go alongside our Abandoned Wagons. Crates and Boxes, Beer Barrels and a long table with heaped furniture. The smaller ones come two to the pack. You can buy three packs and save plus we have the option on screen to purchase painted and ready for instant use. Click through to check them out HERE and to see more pictures and free downloads too. Go to our BLOG for in game shots too. Part Seventeen of Andy Jefcoate's adventures in Flintloque sees him continue his use of Crystal Elves in their armour with two handed weapons in his games against the Witchlands Undead. Click through to read the article and see more pictures. Additionally 5024 Escape the Dark Czar beginners box set is back in stock if you want to get into the Witchlands and fight the Undead too with ten miniatures, booklet, dice and bases. Thirteen brand new 6mm scale vehicles! Packs and singles. Bradley Miniatures second wave! Super Heavy Tanks, Walkers, MBT's and lighter vehicles as well as the massive Corvo Dropship. All now released! Click through to see great images of these new codes plus the rest of the 6mm range HERE; all twenty eight codes. Read more on our BLOG. Wild Elf Skirmishers now released for Flintloque and Slaughterloo! A new unit pack with eight different poses of Tuscani Condottierie Light Infantry armed with the mighty Ogre Rifle. Following up on the release of the Tuscani line infantry last year we have free download articles and a scenario too in the article. We also release BS29 Campaigning Packs six different 28mm back packs for Horse and Musket period; get a set or choose singles. Full details plus pictures on the BLOG. Enjoy and thanks for your custom.